Computer simulation of colliding black holes. A quick recap: The theory of general relativity predicts that certain events in the universe can turn mass into energy and emit gravitational waves, or ripples in the very shape of spacetime that travel at the speed of light. Two of LIGO’s mile-plus-long detectors, one in Washington State and one in Louisiana, and the Virgo detector in Italy hunt for this signal with interferometers. Essentially, they split and recombine laser light, which shines onto a detector. 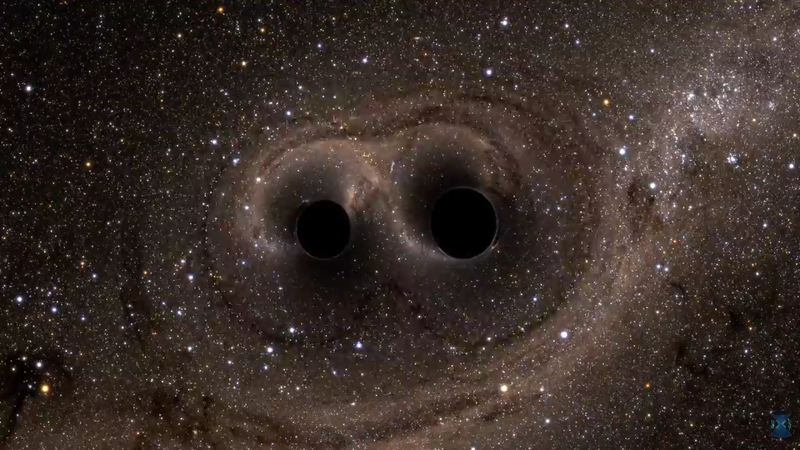 The passing gravitational wave causes the two laser beams to go in and out of phase with each another. The signal causes a wobble smaller than a proton’s width. One of the collisions, the one that resulted in a black hole 80.3 times the Sun’s mass, was especially interesting. Scientists don’t think stars collapsing can result in black holes heavier than 45 solar masses, explained Imre Bartos, University of Florida assistant professor. Plus, it appeared to spin quickly. Perhaps this anomalous observation came from two black holes that merged, and then later merged with a third black hole, in a black hole-rich environment. Such environments even seem to exist near the center of our own galaxy. More observations of gravitational waves will help researchers determine what kinds of environments these collisions occur in, and how black holes get so close together in the first place. But there’s more to be enthused about. They might let scientists hunt for theorized new particles, like axions. And black hole collisions aren’t the only things that produce gravitational waves; colliding neutron stars do, too. Though scientists didn’t find any new neutron star collisions yet, having a large catalog of neutron star collisions will allow them a new way to determine how quickly the universe is expanding. It’s exciting times for observational gravitational wave astronomy, a field that only officially began in 2015. New detectors will soon come online to independently verify the discoveries, and more will be learned from more data. Data collection at LIGO and Virgo begins again next spring.